Canada's most impressive tribute overseas to those Canadians who fought and gave their lives in the First World War is the majestic and inspiring Canadian National Vimy Memorial which overlooks the Douai Plain from the highest point of Vimy Ridge, about ten kilometres north of Arras. The Memorial does more than mark the site of the engagement that Canadians were to remember with more pride than any other operation of the First World War. It stands as a tribute to all who served their country in battle in that four-year struggle and particularly to those who gave their lives. At the base of the Memorial, these words appear in French and in English: To the valour of their Countrymen in the Great War And in memory of their sixty Thousand dead this monument Is raised by the people of Canada. Carved on the walls of the monument are the names of 11,285 Canadian soldiers who were killed in France and whose final resting place was then unknown. Standing on the monument’s wide stone terrace overlooking the broad fields and rolling hills of Northern France, one can see other places where Canadians fought and died. More than 7,000 are buried in 30 war cemeteries within a 20-kilometre radius of the Vimy Memorial. 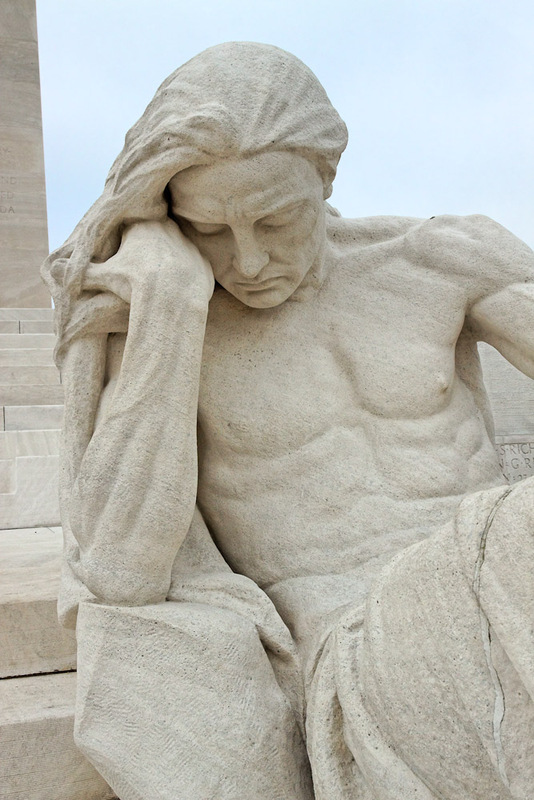 Altogether, more than 66,000 Canadian service personnel died in the First World War.Designed by Canadian sculptor and architect Walter Seymour Allward, the monument took eleven years to build. It rests on a bed of 11,000 tonnes of concrete, reinforced with hundreds of tonnes of steel. The towering pylons and sculptured figures contain almost 6,000 tonnes of limestone brought to the site from an abandoned Roman quarry on the Adriatic Sea (in present day Croatia). The figures were carved where they now stand from huge blocks of this stone. A cloaked figure stands at the front, or east side, of the monument overlooking the Douai Plain. It was carved from a single, 30-tonne block and is the largest piece in the monument. This sorrowing fi gure of a woman represents Canada—a young nation mourning her dead. Below is a tomb, draped in laurel branches and bearing a helmet and sword..